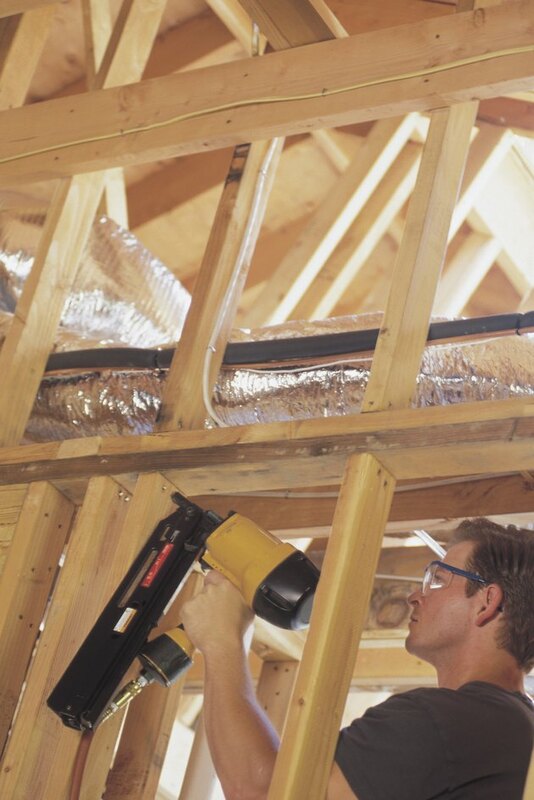 Nail guns are standard equipment in the construction industry. Power nailers haven't quite rendered hammers obsolete, but they've come close, at least in the construction trades. If you're a homeowner who likes to do improvement work on your own, you'd do well to have one of these useful tools, but you might not need one with the same capabilities as the one a framing carpenter uses. That still leaves you plenty of choices as manufacturers continue to roll out new models. Some nailers shoot actual nails, others shoot wire brads or finish nails, and still others shoot staples. You'll probably prefer a compressor-powered pneumatic nailer for heavy work, but if you do cabinetry or finish work, you might like a corded or cordless tool. 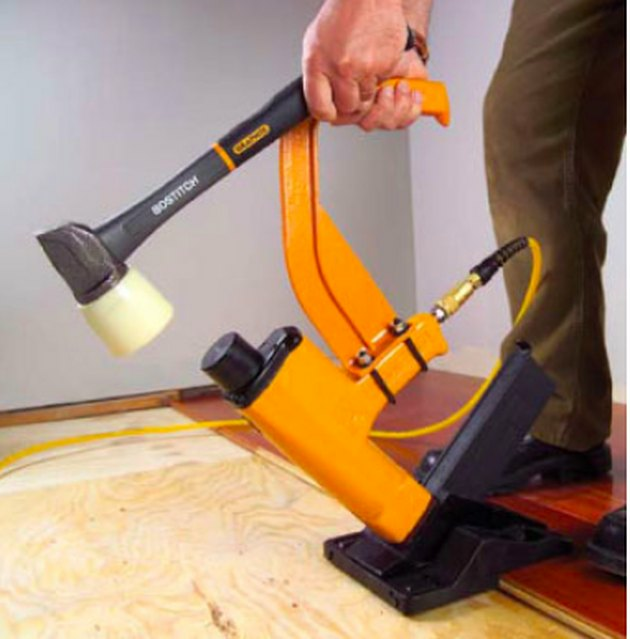 It's possible to use a conventional nailer to install hardwood flooring, but you'll be better off with a pneumatic-assisted flooring nailer for this particular job. A finish nailer or stapler shoots thin fasteners that hold baseboards securely. Just as you wouldn't try to assemble a cabinet using 16d sinker nails, you wouldn't use a construction-grade nail gun for such a job. Nail guns are sized according to the fasteners they shoot. Framing nailers are large, heavy tools with long magazines that can hold about 30 fasteners and develop enough driving force to sink them into dense wood. 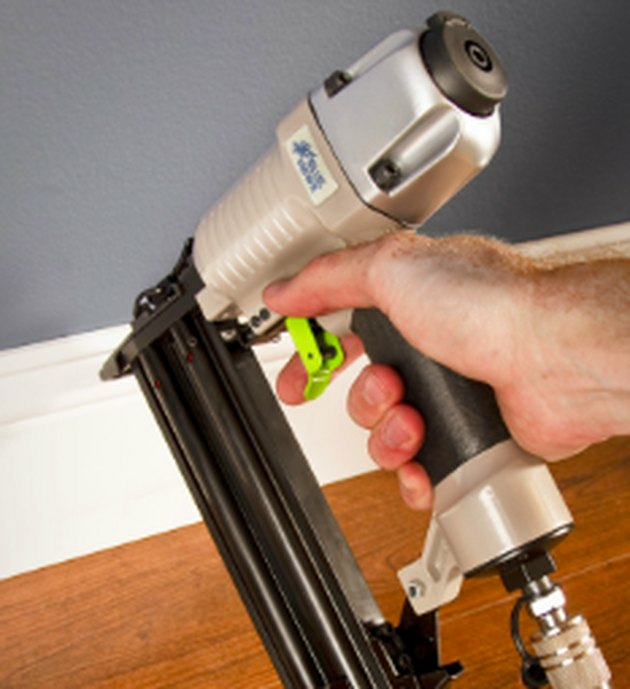 On the other end of the scale, a pin nailer that shoots narrow 23-gauge fasteners is the tool you need to assemble cabinetry and do similarly delicate jobs such as installing crown molding. Installing baseboard trim? You'll need a finish nailer or stapler that shoots 18-gauge fasteners. They hold baseboards securely and are useful for many other DIY projects, but beware. They can split delicate wood and aren't always suitable for cabinetry work. If you're installing delicate trim or doing furniture repair, and you need more holding power than a pin nailer offers, choose a brad nailer. Brads are similar to finish nails in holding power, but they are thinner and don't have heads, which makes them easier to camouflage with wood filler. 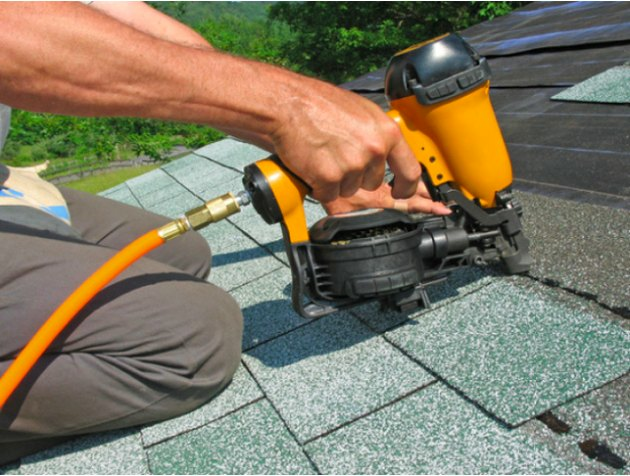 Roofing nailers have coil cartridges that hold more fasteners than other magazines. Certain jobs call for special fasteners, and manufacturers offer guns that shoot them. These guns generally aren't that useful for jobs other than the ones for which they are intended, but they are all but indispensable for those intended applications. Roofing nails are typically 1 to 1 1/2 inches in length and have a wide gauge and a large head. The gun that shoots these nails is a squat version of a 16-gauge framing nailer, and it often features a round magazine that holds many more fasteners than a conventional straight one. It's the only tool that shoots roofing nails, and because it holds extra fasteners, you don't have to refill it as often. That's a huge advantage when you're working on a roof. One of the most troublesome tasks for a framer is driving 1-inch nails to hold joist hangers and post caps. There usually isn't enough clearance for a conventional nail gun, but there is for a palm nailer, which fits into the palm of your hand and shoots common nails of all sizes. The tradeoff for the extra maneuverability is that it lacks a magazine, so you have to insert each nail in the head before driving it. 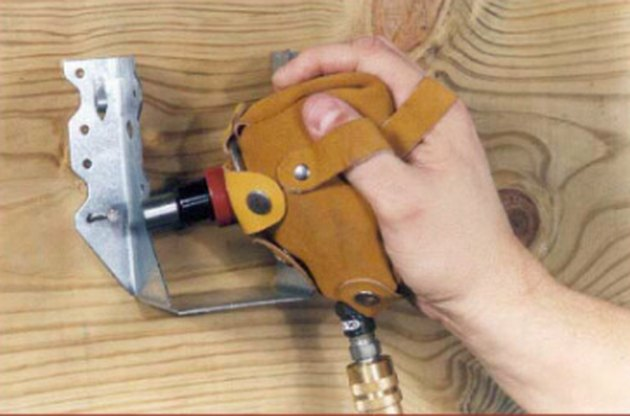 A palm nailer shoots common nails and fits into tight corners. To secure tongue-and-groove hardwood boards to the subfloor, you have to drive nails through the tongues at a 30- to 45-degree angle. The recommended tool for this job is a flooring nailer than shoots barbed cleats. These nailers typically have a spring-loaded plunger that you hit with a mallet. Pneumatic-assisted nailers use compressed air to make the job easier, and you can even buy flooring nailers that run entirely on compressed air, eliminating the need for a mallet altogether. Compressed air make driving flooring cleats easier. A framing carpenter driving 3-inch sinkers is going to need a compressed air gun, but for home craftspeople, generally, the choice is generally between a pneumatic tool and an electric one. If you don't like having an air hose in the way, you probably won't like having an electric cord either, especially if you're working on a roof or out working on a fence. That still leaves you lots of options. 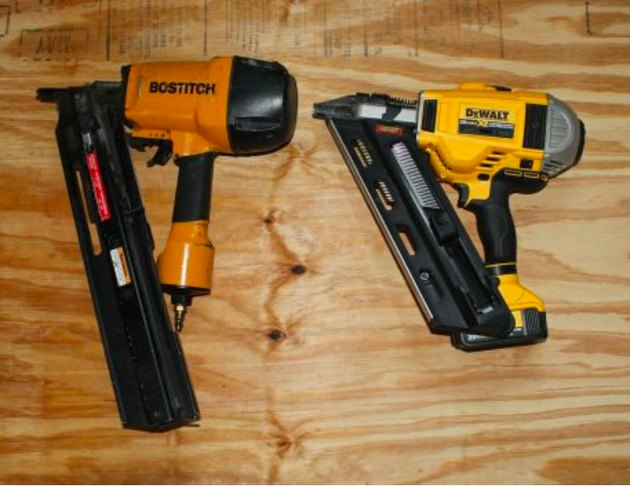 Cordless power nailers can drive fasteners up to 2 1/2 inches in length and generally weigh about as much as a pneumatic tool with the battery attached. The battery does add extra bulk to the tool that may make it difficult to maneuver in tight spaces, but air hoses and electric cords get in the way just as much, if not more. Common magazine angles include 21 and 28 degrees. Many -duty power nailers feature angled magazines to save space. Angles of 21 and 28 degrees between the magazine and the tip of the gun are typical, and you can also find medium-duty nailers that feature 33-degree angles. The angle doesn't affect the efficiency of the gun or the angle at which it drives nails—which is always 90 degrees relative to the surface you're nailing. One consideration, however, is that the heads of the nails in guns with 28-degree angles are often clipped to allow more nails to fit into the magazine. Clipped nails aren't allowed by code for some purposes, so it's best to check with your building department before purchasing a tool that uses them. What Is the Difference Between Arrow T50 & T55 Staple Guns?